The planet Jupiter is shown in the adjacent Hubble Space Telescope true-color image (Ref). Jupiter is by far the largest of the planets. It is more than twice as massive as all other planets combined; if it had been only about 100 times more massive at birth (not so much by astronomical standards) it would have become a star instead of a planet. Then the Solar System might be a double star system instead of a single star with a planetary system. Jupiter has features very different from terrestrial planets. Its composition is more like that of stars, and if it has any solid surface it is hidden deep at its center: Jupiter is apparently almost entirely gas and liquid. It also has an internal energy source and enormous magnetic fields. Finally, the 4 largest moons of Jupiter (the Galilean Moons) are sufficiently interesting in their own right that they are among the most studied objects in the Solar System. We shall devote a separate section to studying their properties. Our most detailed information concerning Jupiter has come from the space probes Pioneer 10 (1973), Pioneer 11 (1974), Voyager I (March, 1979), Voyager II (July, 1979), and Galileo (1995-present). The first 4 were flyby missions; the Galileo probe was inserted into orbit around Jupiter December, 1995, and launched a probe into the atmosphere that transmitted information before being destroyed. The Galileo orbiter is in a complex orbit that has been examining Jupiter and the Galilean moons. The planet Jupiter is 5.2 A.U. from the Sun on average, which corresponds to an orbital period of 11.9 Earth years. It is the most massive planet, being 318 times as massive as the Earth, and about 2 1/2 times the mass of all other planets combined. Jupiter is massive because it has a large diameter (11.2 times that of Earth). Its density is only 1.33 g/cc, which is 1/4 that of Earth, and only slightly more than the 1 g/cc characteristic of water. This very low density compared with the terrestrial planets is because it is composed mostly of hydrogen and helium, in ratios similar to that found in stars (approximately 82% hydrogen and 17% helium by mass). Furthermore, Jupiter is almost entirely gas and liquid. Therefore, Jupiter and the related planets Saturn, Uranus, and Neptune are sometimes called Gas Giants (these are also called the Jovian Planets, since Jove was another name for Jupiter). We guess that Jupiter probably has a small rocky core comparable in size to terrestrial planets and perhaps with a similar composition, but we have no direct evidence of this. Because Jupiter is not solid its parts do not rotate at exactly the same velocity. However, measurements of the rotation of the magnetic field give a rotation period of 9 hours and 55 minutes. This rapid rotation and the gas and liquid structure give rise to a pronounced equatorial bulge that is evident in images such as the adjacent one. As also indicated in the adjacent computer-enhanced image , the atmosphere has clouds with a colorful and complex structure. These features are partially associated with the effect of very high velocity winds in the Jovian atmosphere (as much as 900 km/hr). It also has an large, complex, and very intense magnetic field, and has a system of 16 moons that is a kind of miniature Solar System unto itself. It has an internal heat source, since it emits more radiation than it receives. This is thought to be associated with residual heat left over from the formation of the planet. Finally, it even has a faint ring. Jupiter has a very complex atmosphere. It is dominated by colorful bands and turbulent swirls, as illustrated in the following two images. All that we see is the top of the atmosphere. The light bands are called zones and the darker bands are called belts. The zones tend to be white or yellow, while the belts are often some shade of reddish brown. Temperature measurements by the Pioneer spacecraft (1973) established that the temperature of the dark belts is higher than that of the light zones, implying that the former are lower in the atmosphere. Thus, the belts appear to be regions of descending gas and the zones are regions of rising gas. Each hemisphere has around 6 bands with winds blowing at very high velocities in opposite directions. This accounts for the extensive shear and turbulence at the boundaries between these regions (see the next section on the Great Red Spot). Large lightning bolts and extensive aurora have been observed in the Jovian atmosphere, as we will discuss further when we consider Jupiter's magnetic field. The most prominent feature is the "Great Red Spot", which may be seen on the right of the upper left image, just below the equator, and in the two images shown below. As we shall discuss in the next section, it is a kind of large and persistent storm driven by Jupiter's internal heat source. The explanation for the color of Jupiter's clouds is still something of a mystery. Although there are compounds in Jupiter's atmosphere that could account for the colors if the atmosphere were warmer, they should not be the colors that are observed at the very cold temperatures in the tops of Jupiter's clouds (about -150 degrees Celsius). It has been suggested that the colors result either from colorful hydrogen compounds welling up from warmer regions, or from colorful compounds associated with trace amounts of elements like sulfur in the atmosphere. Consultation of past observations of Jupiter indicates that the clouds change their colors over time. The Galileo Project is in the process of generating large amounts of new information about Jupiter and its moons. The interpretation of the information sent back by the probe that plunged into the atmosphere should yield valuable insight, as will the extended observations from the Galileo orbiter. Here is the present position and projected orbit of Galileo. The Great Red Spot is a great anti-cyclonic (high pressure) storm akin to a hurricane on Earth, but it is enormous (three Earths would fit within its boundaries) and it has persisted for at least the 400 years that humans have observed it through telescopes. Since it is anti-cyclonic in Jupiter's Southern hemisphere, the rotation is counterclockwise, with a period of about 6 days. (A hurricane in Earth's Southern hemisphere rotates clockwise because it is a low pressure system.) The clouds associated with the Spot appear to be about 8 km above neighboring cloud tops. The following two figures show a recent Galileo view of the Great Red Spot, and a closeup of the turbulence in its vicinity. The Coriolis effects that are responsible for cyclones and anti-cyclones on Earth are greatly magnified on Jupiter, which has a rotational frequency about 2 1/2 times that of Earth, but this alone would not account for the persistence and size of the Great Red Spot. 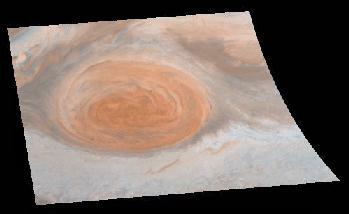 There are other features similar to the Great Red Spot on the surface (note the white spots in the above images) but none are as large as the Great Red Spot. Presumably the persistence of the Great Red Spot is related to the fact that it never comes over land, as in the case of a hurricane on Earth, and that it is driven by Jupiter's internal heat source. Computer simulations suggest that such large disturbances may be stable on Jupiter, and that stronger disturbances tend to absorb weaker ones, which may explain the size of the Great Red Spot. Furthermore, as for the clouds in general, we do not understand fully the reason for the coloring. It has been suggested that certain compounds of phosphorous are responsible for the reddish-brown hue, but this remains somewhat speculative. Thus, we understand the broad properties, but not all the detailed features of this remarkable phenomenon. Most of the interior of Jupiter is liquid (primarily hydrogen and about 10% helium). The central temperatures are thought to lie in the 13,000-35,000 degree Celsius range, and the central pressure is about 100 million Earth atmospheres. We infer indirectly that the small core (perhaps a few tens of Earth masses) is rocky. The inner layers of highly compressed hydrogen are in a state that has never been produced on the Earth. Normally, hydrogen does not conduct heat or electricity very well, which are defining characteristics for a metal. Thus, under normal conditions hydrogen is not a metal. Under the extreme pressure found deep inside Jupiter, theory suggests that the electrons are released from the hydrogen molecules and are free to move about the interior. This causes hydrogen to behave as a metal: it becomes conducting for both heat and electricity. The intense magnetic field of Jupiter is thought to result from electrical currents in this region of metallic hydrogen that is spinning rapidly and thought to compose 75% of the planet's mass. We are limited in our understanding of Jupiter's interior by the fact that we have no laboratory knowledge of the behavior of hydrogen under such conditions and are forced to rely on theory. Conversely, the properties of Jupiter provide a stringent test of our understanding of matter under such extreme conditions. Jupiter radiates 1.6 times a much energy as falls on it from the Sun. Thus, Jupiter has an internal heat source. It is thought that much of this heat is residual heat left over from the original collapse of the primordial nebula to form the Solar System, but some may come from slow contraction (liquids are highly incompressible, so Jupiter cannot be contracting very much.) This internal heat source is presumably responsible for driving the complex weather pattern in its atmosphere, unlike the Earth where the primary heat source driving the weather is the Sun. A Large Planet or a Failed Star? Calculations suggest that Jupiter lacks the mass to initiate hydrogen fusion reactions in its core and become a star by about a factor of 100. Since factors of 100 are not so large on astrophysical mass scales, it is legitimate at some level to view Jupiter as either a very large planet, or a failed star. Jupiter has a large, complex, and intense magnetic field that is thought to arise from electrical currents in the rapidly spinning metallic hydrogen interior. The Earth has a strong magnetic field, but Jupiter's magnetic field at the tops of its clouds is 10 times stronger than that of the Earth. Further, the Jovian magnetic field has much higher complexity than that of the Earth, with some aspects of Jupiter's fields having no Earthly counterpart. The intensity and complexity relative to the magnetic field of the Earth is presumably related in some way to the more rapid rotation and larger metallic interior for Jupiter. The following figure shows the field lines and some other features of Jupiter's magnetic field. The field is doughnut shaped (toroidal), containing giant versions of the Earth's Van Allen Belts that trap high-energy charged particles (mostly electrons and protons). Because of the forces associated with the rapid rotation of Jupiter and its magnetic field, these "belts" are flattened into "plasma sheets" in the case of Jupiter. The field rotates with the approximately 9 hour rotational period of the planet. The satellites Amalthea, Io, Europa, and Ganymede all orbit through this region; they are affected by it and in turn affect the magnetic field and charged-particle belts, as we discuss further below. For example, the surface of Io is being eroded by collisions with these particles as it moves about its orbit. The plasma torus indicated in the preceding figure is associated with the orbit of Io. As we will see, Io has multiple active volcanoes on its surface. These spew a gas of particles into space that become ionized as Io moves about its orbit, and these particles eventually diffuse into the rest of the region surrounding Jupiter. As we discuss further below, this is a major source of the charged particles trapped in the Jovian magnetic field. Thus, Io is both responsible for many of the charged particles in Jupiter's magnetic field, and is being eroded by collisions with those particles as it orbits Jupiter. The magnetosphere of Jupiter (the region of space dominated by its magnetic field is enormous. It interacts with the solar wind of charged particles from the Sun as far as 7 million kilometers from Jupiter, forming a "bow shock" much like that produced by the bow of a ship in water that deflects the charged particles of the solar wind. The following figure illustrates. The magnetosphere is strongly affected by the solar wind, pulsing in shape and size. It can shrink to 1/3 of its maximum size when the solar wind is strong. Intense auroras have been observed on Jupiter. The following figure shows Hubble Space Telescope images of auroras near the Jovian poles. On Earth, many of the charged particles trapped in our magnetic field originate in the solar wind. Since the bow shock of Jupiter's magnetosphere deflects the solar wind well away from Jupiter's atmosphere, the charged particles responsible for Jupiter's auroras must come from another source. They are thought to originate from the innermost satellites like Io that orbit in the region of strong magnetic field and trapped charged particles. At one time, Saturn, with it's beautiful ring system, was thought to be an anomaly in the Solar System: why did Saturn, and no other planet, have rings? As we have explored the outer planets in more detail, we now know that there are multiple ring systems in the Solar System. None are as spectacular as that of Saturn, but we now view rings as common occurences. The adjacent image shows that Jupiter also has a ring, though it is extremely faint. The ring was discovered by Voyager I in 1979 and is at a radius of about 1.8 times the radius of the planet (which is inside the radius of the innermost moon). It seems to be composed of small (micron size) particles, probably from Io's volcanoes and from debris knocked off the inner moons by meteor impacts.